I’ve known plenty of doctors and lawyers who want to be farmers. I’m the only farmer I know who wants to be a hunter-gatherer. I’m still foraging, but haven’t written about it lately because I haven’t added any new plants to my diet. It’s intimidating and takes time to learn and harvest and try a new plant. Sam Thayer says learning four of five new ones a year is a manageable goal. The plants above took only fifteen minutes to harvest and prepare. The greens on the left will be eaten in a salad. The stems on the right will be diced and cooked with hamburger. For the thrill of guessing, no prizes this time, what are the plants pictured above and the main one pictured below? These wild edibles usually grow so profusely, they make our gardens look like a wasteland. This entry was posted on Friday, May 31st, 2013 at 10:14 am and is filed under Curious weeds, Curious wild food. You can follow any responses to this entry through the RSS 2.0 feed. You can leave a response, or trackback from your own site. 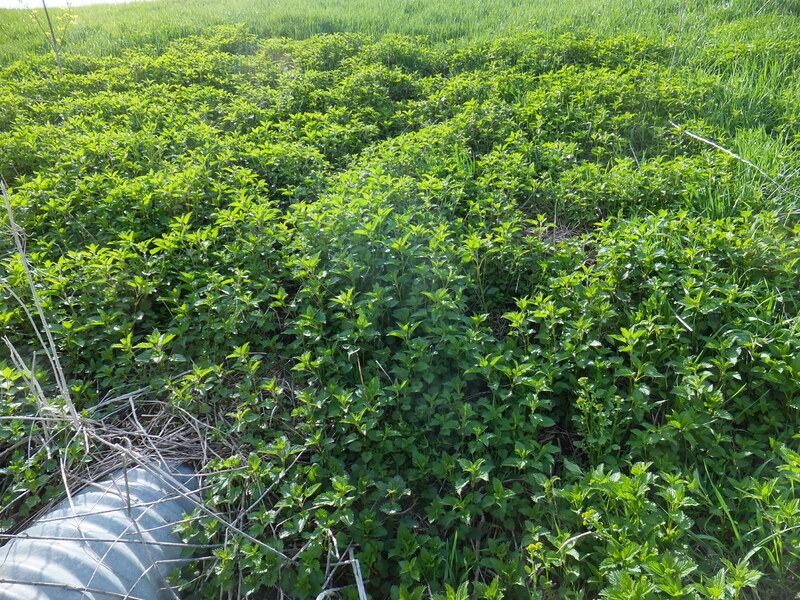 Yes, I think nettles in the field picture, and lambsquarter for the leaves? 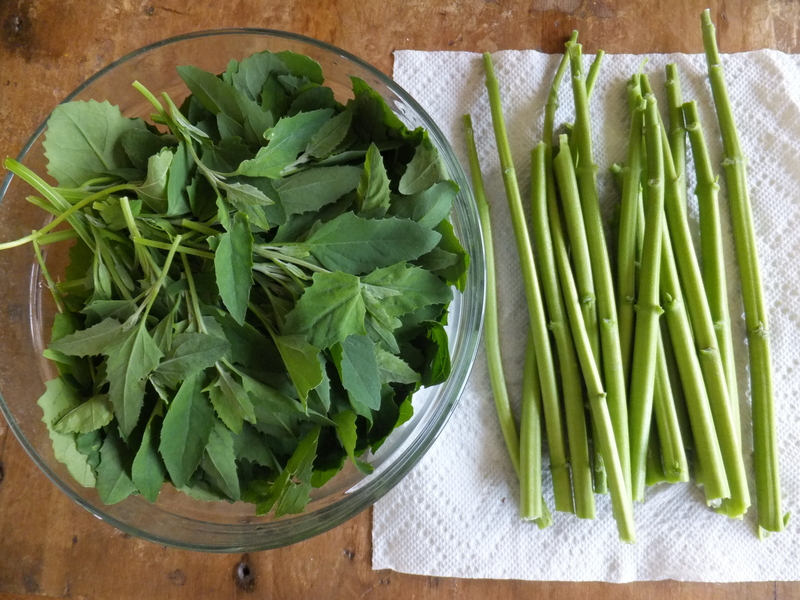 My great grandmother from North Dakota said they ate lambsquarter a lot in salads. Yes, we have winning guesses! That’s interesting about your great grandmother, Michelle. There certainly isn’t a deficiency in lambsquarter now. It makes a nice salad especially mixed with spinach and a little dressing. The stems or stalks may be more difficult to guess. They look much different before their leaves are removed. They’ve just started to appear on south-facing slopes here in southwest Wisconsin. It’s only a short time in which the stalk is edible before it becomes tough, but there are many other uses for this marvelous plant. I’m a lawyer who wants to be a farmer! I am doing a farm stay in Ontario this summer at a pastured pig farm (large black). I can’t wait to ditch my office and iphone in exchange for a field and a shovel. Erinn, what an exciting summer for you! Are you blogging your adventure, or keeping a journal? I will definitely keep a journal and bring a camera. I’ve thought about blogging too–I don’t think I have enough to say to keep an audience interested for very long, but I do hope that my Little Lawyer on the Prairie adventure will be quite successful and entertaining! Let us know where we can find your blog!